If you have someone in your life who loves yoga, you know how their practice is an important part of their lifestyle. 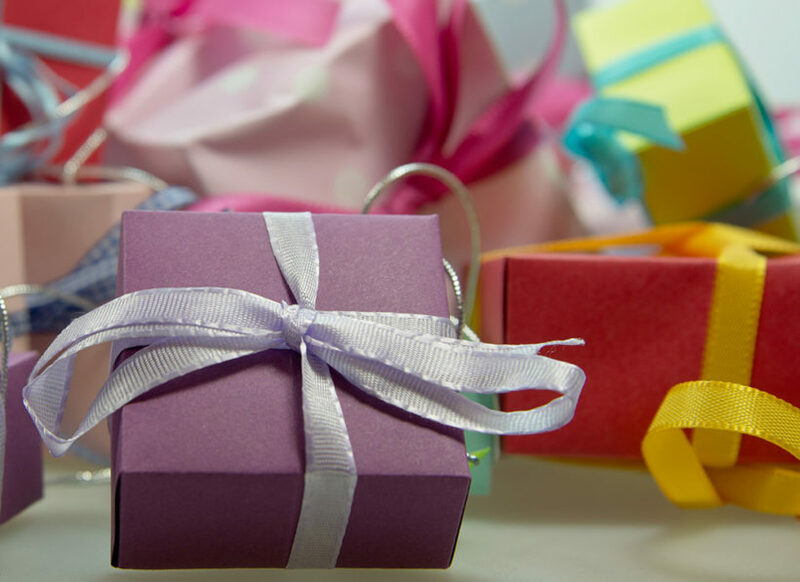 So, it makes sense that when birthdays, Christmas, and other gift-giving events roll around that you want to give them an awesome, creative, and useful gift to help fuel their practice. But sometimes that can be tricky, especially if you’re not a yogi yourself. You may just think yoga is about doing a bunch of stretches and know nothing else. That’s okay, we’ve got you covered. We’ve rounded up some awesome yoga gift ideas that will delight friends, family members, or even co-workers who always start their days with a few Sun Salutations. These gifts are great for seasoned yogis, yoga instructors, and newbies to yoga practice. Some are practical gifts that will enhance their yoga practice and others are just plain fun. These gifts vary in price range, so you’ll find the perfect present for a Birthday or an affordable gift for Secret Santa or stocking stuffers. Check them out–maybe they’ll make you interested in some yoga yourself. This a great gift for yogis that will put a smile on their face every morning. This mug features illustrations showing how to do popular yoga poses (including poses that stimulate each of the chakras and a break down of the Sun Salutation), a great way to remind a beginner yogi to do their morning practice after they finish a cup of coffee or tea. This mug makes a great gift because it also comes with a yoga mat coaster in an attractive gift box. This is a great choice if you’re looking for yoga gift ideas for a co-worker for the office Secret Santa gift exchange. This is a fun option if you’re looking for gifts for yogis. The famous Magnetic Poetry Kit is famous for amusing people by creating sentences on a refrigerator or other magnetic surfaces. This kit is specially currated for yogis, come with 200 word magnets that will remind you of a yoga class. Some of the words that come with the kit include release, light, honor, salutation, warrior, and salutation. All of the kits are the same size and font, so you can easily mix and match with other kits that match your loved one’s interest. Other sets that yogis will love include Healing Words and Zen. If you’re looking for practical yoga gift ideas, this is a great option. These beautiful, silk eye pillows are scented with lavender and flaxseed and are meant to block out light for relaxation or sleep. They’re perfect to use while meditating or during savasana at the end of a yoga practice. This eye pillow is unique in that it can also be used as a hot or cold therapy pad to soothe sore muscles, reduce puffy eyes, and even more uses. This is another practical gift for yoga lovers with a ton of uses. These toeless yoga socks from Gaiam are the perfect accessory for any yoga practice. Their main purpose is to allow a person to do yoga anywhere, on any surface without a mat. The grips on the bottom of the socks help you keep your feet in place in any pose. These yoga socks are also perfect for hot and sweaty yoga classes when you have a tendency to slip around on the mat. They’re also good for keeping your feet warm during colder months and offer a hygienic way to practice in a yoga studio. These socks are available in gray and black. This, in combination with the Gaiam Yoga Gloves makes a great gift for yogis on the go, as they are lightweight, easy to pack in a suitcase or carry-on bag so you can do yoga anywhere when you travel. Wrap bracelets and mala necklaces are popular with yoga enthusiasts. They’re made of beads of precious gemstones or wood that have specific healing properties and meanings. This classic wrap style bracelet is made of natural jasper beads and a tree of life charm. This bracelet is meant to be a reminder to celebrate life and life it to the fullest. Any yogi will appreciate the special meaning behind this gift. If you want to find the perfect mala necklace or bracelet to give as a gift, check out meditation beads meanings by color. Hydration is an important part of any yoga practice. While water is the best way to rehydrate after your asanas, it can get boring. This infuser water bottle lets you create delicious drinks affordably from your own fruits and herbs. The leak-proof bottle is great for taking to the gym, the yoga studio, or the park. This is one of the best yoga gifts you can get if you’re looking for a practical gift to give. Some delicious infused water ideas include raspberry and mint, cucumbers and lemons, ginger and peach, or blueberry and orange. Check out these easy infused water recipes for more. These are fun gift ideas for yoga lovers who are burly men or anyone who enjoys a little humor. This set of figures is a spin on the traditional army men toys, with a non-violent spin. The 9 men are doing different yoga poses including tree pose, warrior one, cobra, downward facing dog, meditation, child’s pose, crow pose, warrior two, and headstand. Made in the traditional green plastic, these are about these size of regular army men toys. These make a great gift for kids or for yoga lovers to display on their desk at work. If you’re looking for gift ideas for yogis who practice at home, this is a great choice. These Yoga Cards are a visual practice guide that helps teach newbies how to do yoga poses and helps advanced yogis plan out their practice. It comes with 47 yoga poses, 3 breathing exercises, a meditation card, and five sequences. The deck is available in a version for women or men. Giving these cards is like giving the gift of a regular at-home-yoga practice. If your loved one travels a lot, this is the perfect yoga gift for them. Travel yoga mats are made to be compact and lightweight while giving the benefits of a sticky mat that allows you to practice anywhere. While the YOGO mat is meant to fold up for easy storage in a suitcase or carry-on bag, it’s also great to toss in a backpack or tote bag and carry to the studio. The YOGO folds down to the size of a newspaper and weights only 2.6 lbs. It’s still a full 24″ x 68″ when unfolded. Made from rubber harvested from sustainable plantations, YOGO also plants a tree for every mat sold. Any yogi will appreciate this sustainable and portable yoga mat. Check out more travel yoga mats for yoga practice anywhere. If you’re looking for fun and functional yoga gift ideas, here’s a great one. This tank top is great to wear to the yoga studio, with the fun graphic “Yoga, I’m Down Dog” printed on the front. Any yogi will appreciate this fun tank. Available in women’s sizes: small, medium, large, and x-large. Cleaning a yoga mat is one of the inconvenient necessities of a regular yoga practice. You can give your favorite yogi a gift to make it even easier. Astura makes a natural and organic mat cleaner in a variety of different scents. It also comes with a microfiber cleaning cloth. This spray is perfectly sized to give as a stocking stuffer. Learn how to clean a yoga mat. This is a silly and fun yoga gift perfect for Secret Santa or a White Elephant gift exchange. Let your hands get a yoga workout with this kit. It comes with mini yoga pants, a tiny yoga mat, and two sets of yoga blocks. This a great gift for office workers who want a fun desk toy. Written by Paramhansa Yogananda, Autobiography of a Yogi is essential reading for anyone who practices yoga. This edition is a verbatim reprinting of the original edition printed during Yogananda’s life and also includes bonus chapters. Written for Western readers, the book covers Yogananda’s spiritual journeys and a lifetime of experiences as well as his teachers on self-realization. This is a cute and fun gift idea for yogis. 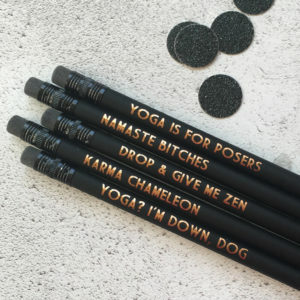 Bettie Confetti makes custom pencils and this set features funny yoga phrases like “Yoga is for posers” and “Drop & give me zen.” A great gift idea for students and office workers, these pencils make a lovely stocking stuffer. Yoga wheels are some of the hottest props right now. Useful for modifying a variety of yoga poses, including backbends like plow, bridge, and wheel pose, it’s a nice accessory to have for an at-home yoga practice. Since it’s not considered one of the essential yoga accessories, many people don’t have one for their home practice. Check out more yoga benches and props. This is must-have for a home yoga studio or meditation room. Reilly Creation handmakes these personalized yoga mat racks. They engrave them with a name or saying of your choice or with an image like a lotus. You can also choose a finish to match any home decor. 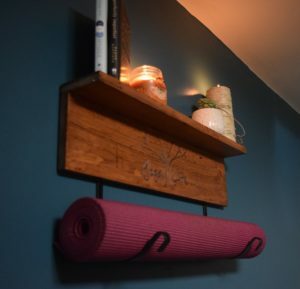 The built-in shelf is perfect for candles, statues, or other yoga related items. If your loved one is looking to start a home yoga practice, this DVD set from Body Wisdom is perfect to get them started. With three DVDs, this set features 40 routines ranging from 15 – 60 minutes. From stress relief to yoga for inflexible people, there’s plenty here for any home practice. Check out more Yoga DVDs for Beginners. Designed by Tilde Hilde Studio, this fun print features a variety of yoga poses demonstrated by minimalist stick figures. This print is perfect for a yoga studio, home office, or anywhere you need a little fun and yoga inspiration. Available in a variety of sizes. If you want practical but thoughtful yoga gift ideas, check out this scarf. Made from 100% cotton, this gorgeous scarf features an om print. This oversized scarf can also be worn as a shawl or used to stay warm during meditation. Available in white, black, blue, and yellow. If your loved one enjoys baking, this is the yoga gift for them! Made from high-quality stainless steel, these 4″ cookie cutters come in three yoga poses, perfect for making mindful treats. Include some other baking goodies to make a nice gift basket. Searching for more gift ideas? Check out these meditation gifts, gifts for fitness buffs and runners gifts.